in Search Marketing with tags dynamic sitelinks, google+ Both comments and trackbacks are closed. 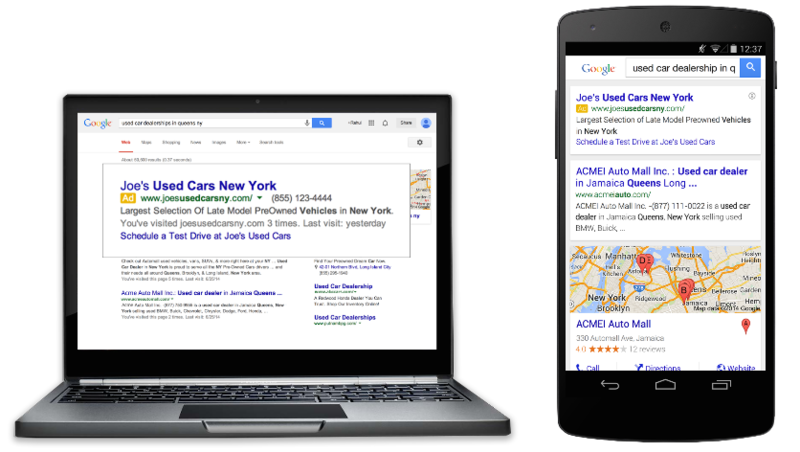 Building on the debut of sitelinks in 2009, Google has introduced dynamic sitelinks to help boost performance for ads appearing without the ad extension. Sitelinks have proven to extend the value of search ads by increasing CTR and linking to content deeper within a site (e.g. in-demand or priority subpages). The difference between advertiser-created sitelinks and dynamic sitelinks is that the latter will be automatically generated based on recent search activity and historical data. This format will only appear for ads on the top and bottom of the SERP and will not show in conjunction with existing sitelinks. Moreover, dynamic sitelinks only render when Google determines that the auto-generated sitelinks will out-perform sitelinks already set up in the account. Dynamic sitelinks will not trump two-line, three-line or enhanced sitelinks and will carry low impression share relative to ad sitelinks. Clicks on dynamic sitelinks are free of charge; however, advertisers will be charged for all other clicks on ad units including headlines and other eligible extensions. Advertisers who have not gone through the process of launching relevant sitelinks across all campaigns and ad groups will benefit from increased coverage through dynamic sitelinks and can expect an increase in CTR. Another advantage is the ability to match website content and link directly to what users are searching for based on past search activity on Google. Clicks on dynamic sitelinks will be attributed to organic traffic in back-end analytics and attribution platforms. Any dynamic components of search can raise concerns for advertisers who don’t have full control over what links show alongside ads. Advertisers with heavy restrictions (legal or other) should weigh the benefits of this new feature. You can disable dynamic sitelinks at any time. While dynamic sitelinks can provide a lift for those who aren’t using sitelinks to their advantage already, it’s important for advertisers to continue to optimize and expand coverage for sitelinks. Not only will sitelinks continue to improve relevancy and performance of ads, but we also know the expected impact of extensions is a key component of Ad Rank.